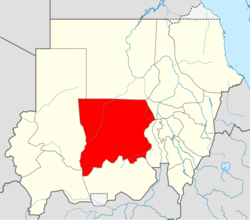 Al-Ubayyid (Arabic: الأبيض‎‎ Al Ubayyiḍ), also spelled El Obeid, is the capital of the state of North Kurdufan, in southern Sudan. In 2008, its population was 340,940. It is an important transportation hub: the terminus of a rail line, the junction of various roads and camel caravan routes, and the end of a pilgrim route from Nigeria. It was founded by the pashas of Ottoman Egypt in 1821 but was subsequently destroyed by the Mahdists in 1883. It was then rebuilt in 1898 following the fall of the Mahdist empire. The population of this town is majority Muslim with a small Christian presence. The town today is the site of an international airport and an oil refinery. Al-Ubayyid is home to the University of Kordofan, established in 1990. The United Nations Mission in Sudan has established its Logistics Base there. As of 2015, the Sudanese Premier League team Hilal Obayed plays in Al-Ubayyid. ↑ The word "Obeid" has three pronounced syllables Uh-bay-id. ↑ "El Obeid Climate Normals 1961–1990". National Oceanic and Atmospheric Administration. Retrieved January 18, 2016.